Last night I attended Brené Brown's Braving the Wilderness book tour. 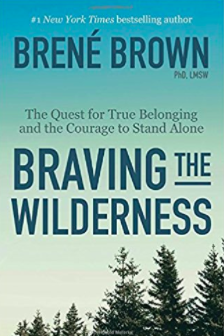 Braving the Wilderness explores the concepts of loneliness and belonging. This morning, I keep hearing a piece of Mary Oliver's poem Wild Geese. in the family of things." Brené Brown talked with us about a global loneliness pandemic. She told us that loneliness is a stronger predictor of an early death than obesity, diabetes, or smoking a pack of cigarettes a day. "Whoever you are, no matter how lonely..."
Chances are, some of you reading this feel the pull of loneliness. I believe all of us feel it at one time or another. ARP's Loneliness Study notes that approximately 42.6 million adults over age 45 in the United States are estimated to be suffering from chronic loneliness. A Forbes article notes that loneliness appears to be most prevalent among Millennials. Time magazine states that the number of Americans who say they have no close friends has roughly tripled in recent decades. So how do we overcome disconnectedness and land in a place of true, enduring, unshakeable belonging? The key may lie in one's ability to belong to oneself. Brené followed by saying that when she researched Angelou's quote, she found that Angelou stated that she belongs only to herself. Think about that. Belonging no place...belonging every place...belonging only to oneself. Could you liberate yourself from the need to find a place of belonging outside of yourself? Do you have the courage to be in community with others and at the same time fully trust in and adore the home that lies within? What would that look like? How would that be possible? My guess is that it starts with a deep and pure love of self. Do you adore you? Do you, at once, accept who you are even as you strive to evolve? Can you hold wonder for the deep darkness and joy for the pure light that co-exists within you? Can you speak and act from a place of complete authenticity, knowing you are safe and connected and whole, always...even when you're alone? This week I invite you to listen for the call of the wild geese (what are you being called to do?). Consider your place in the family of things (feel that you are whole and worthy and hold an important role). And step into a place of adoration of yourself, your dreams and your gifts. Find beauty in your journey, with all of its seeming setbacks and pain. Celebrate you. Believe you are home. Love yourself. Then, step into community with others and love them too. Last week I had the honor of sharing my interactive public art projects with members of the Leadership Development community at The Leadership Circle Summit. I am still processing all that I learned and all of the ways I grew over the past several days. While I am not yet able to articulate my deepest experiences from The Summit, I want to extend my heartfelt gratitude to the organizers, presenters and attendees. I am forever changed from the experiences and community that enveloped me during that three-day period. We launched another #WeLiveBig interactive public art project! In June we launched UNITY, a project to celebrate how diversity strengthens community and unites us as one. View our growing collection of images from the week. Subscribe to our newsletter for a dose of inspiration. We respect your privacy, you may opt out at any time.